This week marks the start of a new set of pictures called “Art and sculptures from Hadrian’s Villa”. Hadrian was the greatest patron of the arts. His imperial villa at Tibur was adorned with the very best of what the Roman empire had to offer in terms of works of art and building materials. Hundreds of statues, reliefs, architectural marbles and other decorations were found in the villa. Many of them have been lost, others are in Museums and private collections around the world. 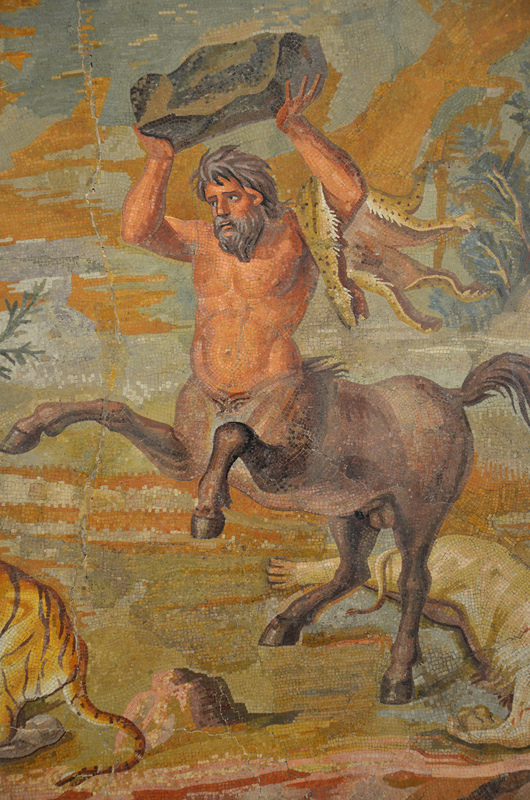 Of particular interest is the central panel (emblema) of a large mosaic depicting a pair of centaurs (mythological creatures with the head, arms, and torso of a man and the body and legs of a horse) fighting wild cats. It is one of the most significant Roman mosaics. Mosaics were used throughout the complex but polychrome mosaics were only used in the noble buildings, mainly paved with opus sectile. This mosaic was found in situ along with other ones that bore depictions of landscapes, animals and masks. It was part of the floor decoration of the dining room (triclinium) in the main palace. Presumably, it was modelled after a Greek panel painting or mosaic from the Hellenistic period. The dramatic scene depicts a centaur casting a rock at the tiger who has slain his female companion. The female centaur lies dead, bloodied by the raking claws of the beast. The mosaic is made of thousands of small, closely set tesserae (1-2 millimiters) called opus vermiculatum. This exquisite mosaic is on display at the Altes Museum in Berlin, along with stunning sculptures of Hadrian and Antinous. I didn’t even know female centaurs existed! Fascinating imagery. I am just completing a papier-mache sculpture of a centaur. How could they have reproduced without females? Though I must admit mine is obviously male!